Back on Track Frost Therapy Waterproof Turnout Horse Rug with a 330 Gram Filling with Welltex Infrared Technology. Black in Colour. 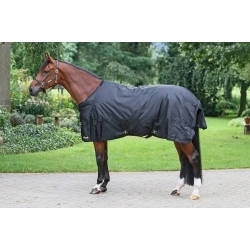 The Back on Track Frost Horse Rug is a unique product that allows your horse to get the Back on Track effect even in bad weather. The Back on Track Frost Rug is a high quality winter rug, made of 1680 Denier Ballistic nylon with 330 gram filling and a Welltex® lining. It is equipped with two chest buckles, two cross surcingles and a tail cover.